This article has been published in "Inspire Journal", November '98 issue. The web publication has been autorized by Bill Pine, of INSPIRE Project. For more information about targets of this project visit NASA-INSPIRE web site. In order to characterize the radio signal reception, of natural origin, more than the fascinating listening, there is the attemp of identifiyng the origin. The research of these signals links with their originating phisics phenomenons, was the target of the present research lasted about a year, between Apr.1997 and Apr.1998. During the year which was chosen for the research, several hundreds of listenig sessions in 100 hz - 10 kHz band have been done at predeterminate times and in order to collect, during the whole year a minimum indispensable quantity of data to quantify the number of these phenomenons as wistlers. Besides the work of data collecting through the reception of the electrical field and the magnetic field a research taken place about physical data related in somewayse to the radionature phenomens. So, every single day have been recorded meteo conditions at geo-magnetic conjugate point also including minimum and maximum temperature. In every single day have been collected data about the solar radio flux at the geomagnetic activity produced by solar wind particels and about the numbers of the sun spots. 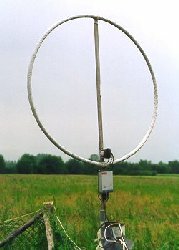 Target of the research was to identify every possible link between the various sizes and was also to verify the possibility of giving forecast about the presence of radio signals of natural origins even if in a short time terms; last but not list warn eventual observatory interested just in case of exceptional conditions of propagation in VLF and ELF. The receiving station was based in the northen part of Italy, near Turin, at geographic coordinate 44° 57’ North, 7° 25’ East. To get a huge quantity of data including the ones of present research you have to imput your own geographic coordinates and the current date. For the receiving station coordinates (near Turin) the result is the CGM a few kilometers from Cape Town, South Africa. But if you appeal to the geomagnetic maps the last new up to date found in Italy is the one published by the military cartografy wich date back to 1967; so this is not valid anymore for the targets of our research. The last two columns have been automatically calculed by the program and allow to have a value which can be graphically compared to other greatness without further elaborations. Table, which only shows a few days observations, has secondarily translated in a graphic form as shown in the example: in the following graphic you can’t deduce many relations between greatnesses but you can easily and efficaciously visualize the quantity of data which has been compared. Actuallty for the practical comparison have been done graphics on monthly periods on limitated number of values every single time. Two dayly sessions have been planned on the observatory timer, one session corresponds to the maximum sun time and the other when the receiver was in the center of the dark zone. Every recorded session lasted for a minute. At the end of the year have been finally noted over than 700 sessions. Every session was recorded in two different ways: electrical and magnetical. For every single session the sonograms has been effected, noted the origin and the quantity of the listened signals. Automatic session described in the previous paragraf are not the only ones: two or three sessions per day have been done but not recorded on tape, lasting from five to twenty minutes. For every single session have been noted observations on the gotten phenomenons. These supplements of listening have permitted the validity control of the criterions planned during the automatic sessions for the wistlers quantifying. By comparing data it has found a mistake at rate below 5%: that meant that two sessions of one minute per day were considered enough in order to determinate the presence or the absence of wistlers. So, supplementary sessions have permitted to obtein even more precise data. 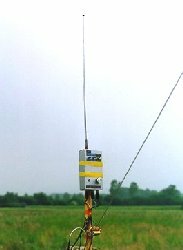 The research utilized two receivers: one of electric field, the RS4, used with a remote probe of a meter based 4 meters high from the ground, in an open field, the second a receiver of magnetic field with a loop multitourn of 75 cm of diameter based two meter high from the ground situated very close to RS4. The two receivers have been tele-powered with a 100 meters multi-core shielded, the same wire which have trasported the signals received inside the station. The two signals have been sent to two chanels of a stereo recorder already arranged in order to making an automatic recording starting from the programmable timer. The target of all of this automatizzazione was to reduce the manual operations of data collecting for spending that time to analize the same data. The data collecting was done both in two different ways: the first one with audio sessions in compact cassette, the second one concerning numerical data about the solar activity at meteo conditions CGM, and about the listening sessions and about the number of wistlers gotten and recorder on the excel workpage. Once a tape was completed, the complet sonogramma was done and the obteined data were included in the computer workpage completing the data necessary to the research. The first reflection coming out from the collected data is the missing of possible links between wistler and the proceeding of other greatnesses. It’s well known that wistlers originate from scharge electric storm related to the magnetic ways (formed by solar activity) and so these greatnesses are related and linked between themselves. Comparing the collected data we couldn’t find any information about that. This doesn’t mean that this link doesn’t exist, but it simply means that a single operator, with his own means, also via Internet, can’t prove the existence of this link. So, the collected data doesn’t allow to forecast anything about the wistlers and their happening even in shorter times. More than once it was evident that some links exist between the presence of Tweeks and the intensity of the solar radio activity. For twice in fact, during a very intense and anomal solar activity lasting few days, tweeks desappear from night sonograms. Their number is strictly related to the number of statics but their intensity stongly seems related to the magnetic storms. 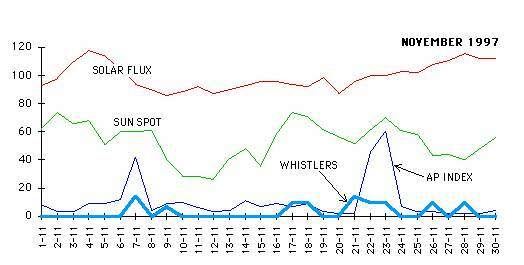 The following graphic shows this phenomenon and the sonogram shows an active night with 4-frequency tweeks. It is out of doubt and certain that at the beginning and origin to wistlers there must be a storm, but apparentelly the collected data about WX and CGM conditions, in our case in Cape Town, are not relyable enough. Data are related to the forecastings which, even if very accurate, leave space to a certain doubt because of the atmosferic weather. More than this during bad weather periods conditions can change in a short distance as few kilometers making the gotten data not very much relyable. The data collected during the whole year didn’t show particular links between the tendence of WX to CGM and the number of receivable wistlers . 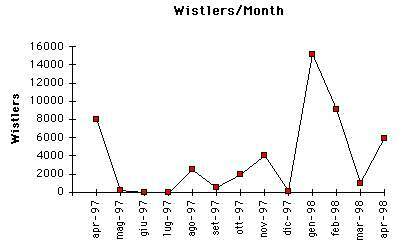 A very interesting data which came out from OPERA experience was the number of days during the year when is possible to listen to wistlers. If, for istance, you are planning listening sessions during the month of february, how many possibilities are they that during a single week you can really get in touch with wistlers? The following graphic gives you this answer. It is clear and obvious in fact that winter months are more favourable for the wistlers listening, knowing as well that the possibility of periods of complete inactivity even for quite long periods can happen. According to the previous data some rules have been established in order to value, in a approximate way, the quantity of wistlers receivable per single month. Since the sessions happened about every six hours, was done the hypothesis that the type of the intensity of the phenomenon was synusoidal, and this was obteined by calculating the quantity of wistlers every six hours and multiplying the result gotten from the listening per 360 total minuts and dividing this value by 1,4. 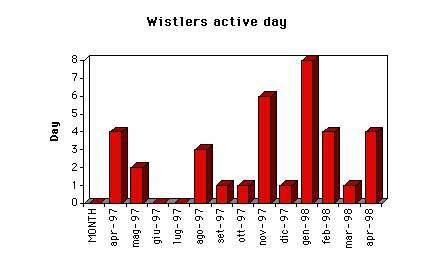 Because of these calculations we can suppose that during the observation period lasted a year we totally score 48500 wistlers. Then, if we subdivide this value for the whole year we get a medium value of 133 wistlers every day: a wistler every 11 minuts. In these statistics it must be considered that the receiving station was not located in a completelly isolated zone, and so we must consider that an 50 Hz noise could avoid reception of even very weak segnals. the general tendences of the phenomenon. 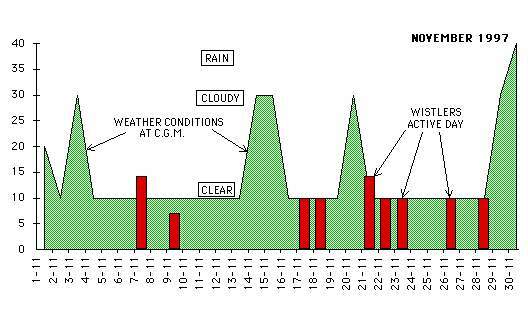 As is shown by the following graphic the winter periods are more favorable to the wistlers listening signals. Even if the presence of wistlers is detectable during day and night time is much easier to get these kind of signals during night time, and this is most valable during the summer time when automatic listening session have never received wistlers signal during the day. Long listening periods, while these phenomenons were present confirmed this tendence. During the listening session for OPERA a very sad event unfortunatelly hit the Italian peninsula which is a high sismic risk zone. The very high number of earthwick has maybe given its contribution to a lucky connection: when a very powerfull earthquick is close to happen have been recorded emissions in magnetic mode and in electric mode, and this happened 15 minutes before the first shake. The signal is very similar to a cellophan sheet that, when wrinkled produces a noise wide band in a receiver RS4. In certain moments it has even rose above the signals of statiche present in banda. This signal has been received with stronger intensity in magnetic receiver compared to the electric one. The distance from earthwick was about 500 km. The peculiarity of the recording is that also another italian operator, living near the earthwick place , could record, in the same period, very similar signals with even higher frequency. In the following picture is shown the sonogramm of a part of this signal. About natural origin radio signals there always were rumours which had origins even from aliens and ghosts. In order to deny spiritual powers about VLF, we must say that in more than 1500 listening sessions done in a year, never have been found particularly strange signals. Everything observerd and recorded was part of the Radio Nature signals studies. The only exception to this rule is the previous paragraph about earthquick: those signals are not fully explained yet, despite, several studies have been done about this complicated matter. All of this makes stronger and stronger the wish men have to give a complete explanation of the physics rules which govern our universe. 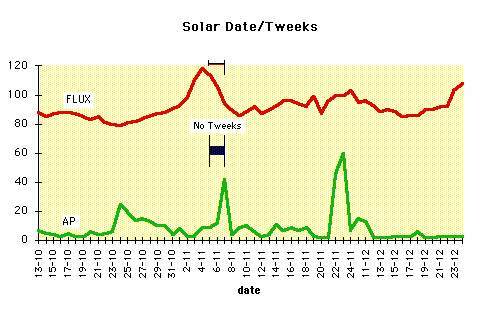 7) Moreover is not given a direct correspondence between solar activity data and the number or received wistlers.